Agile Cigar Reviews are cigar assessments where we use a lightweight, shorter format. These will never take the place of our comprehensive reviews. They are only used on blends we have previously assessed. This might be a blend we are re-scoring or giving a score for the first time. It might be a blend we are looking at in a different size. Today we look at the Saga Short Tales Tomo II-Tales of the Land: Cotuí by De Los Reyes Cigars. This is a cigar we previously assessed back in April 2017. Saga Short Tales is a line that was introduced by De Los Reyes Cigars. The concept behind the line is a series of unique smaller, sized cigars – each with a different blend, different vitola, and different theme. The themes in the Short Tales series each pay homage to the art of tobacco and/or tobacco making. Last year, the second installment of the Short Tales line, the “Tomo II-Tales of the Land: Cotuí ” was released. It’s a cigar built around a very unique tobacco from the Cotui region of the Dominican Republic. Cotuí is a region in the Dominican Republic located about 60 miles southeast of Santiago. The region is known for its gold mining as well as farming. In the region, the Reyes family worked with Monika Kelner, the daughter of Davidoff’s Henke Kelner to produce the wrapper. In addition to the Dominican-grown Cotuí wrapper, the blend also has an Indonesian binder and combination of Dominican and North American tobaccos for the filler. Tales of the Land: Cotuí is available in one size – a 5 x 54 belicoso. As with all Saga cigars, Tales of the Land Cotui is produced at the De Los Reyes factory in the Dominican Republic. 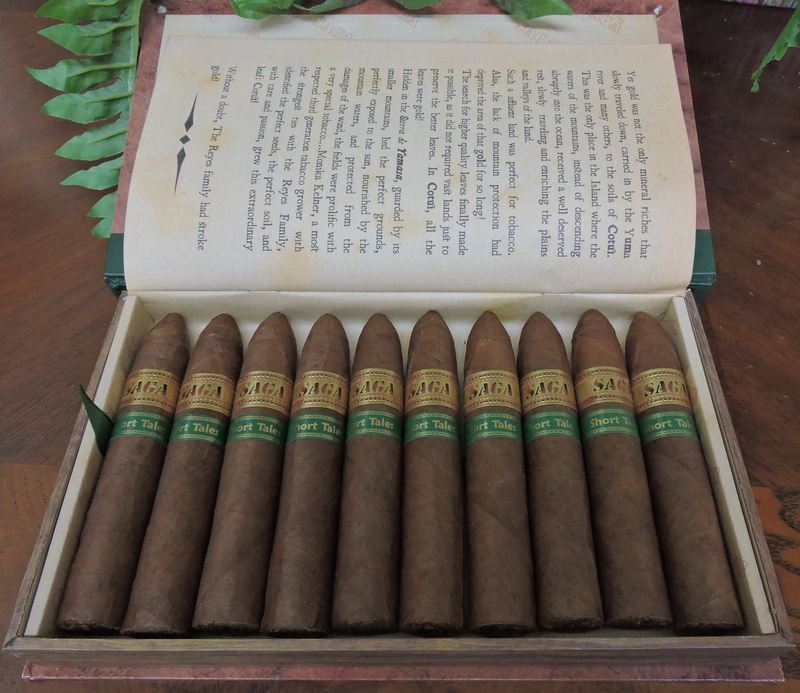 The cigar is presented in ten-count boxes that resemble library books. This packaging design is a staple for the Saga Short Tales line. Tales of the Land: Cotuí started out with a mix cinnamon, cedar, generic wood, and a mix of green and red pepper. Early on the cedar notes moved into the forefront. As the cigar experienced progressed the cinnamon transitioned to a baker’s spice. Later in the first third, the baker’s spice and earth joined the cedar in the forefront. By the second half, the classic wood notes displaced the cedar. The combination of the baker’s spice, pepper, and remaining cedar notes still contributed a nice amount of sweetness and spice. I was a little surprised this time around. 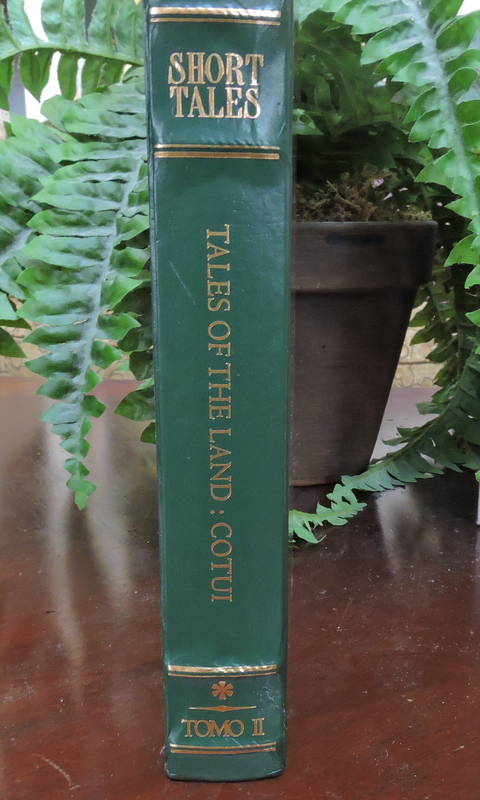 When smoking through this round of Tales of the Land: Cotuí, I found a little more in the way of strength and body than I did the first time. Overall, the cigar delivered a medium to full strength, medium to full-bodied cigar. At the time of this assessment, I had smoked through Tomo I through Tomo V (the first five installments ) of Saga Short Tales. I’ve found each of these cigars is an excellent smoke and that each has its own character. When it comes to Tomo II Tales of the Land: Cotuí, this is the cigar that stands out among the five. The flavors just seem to come together perfectly with this cigar and the Belicoso format works very well. While not a dialed back cigar, this is still one I could recommend to a novice or experienced cigar enthusiast. 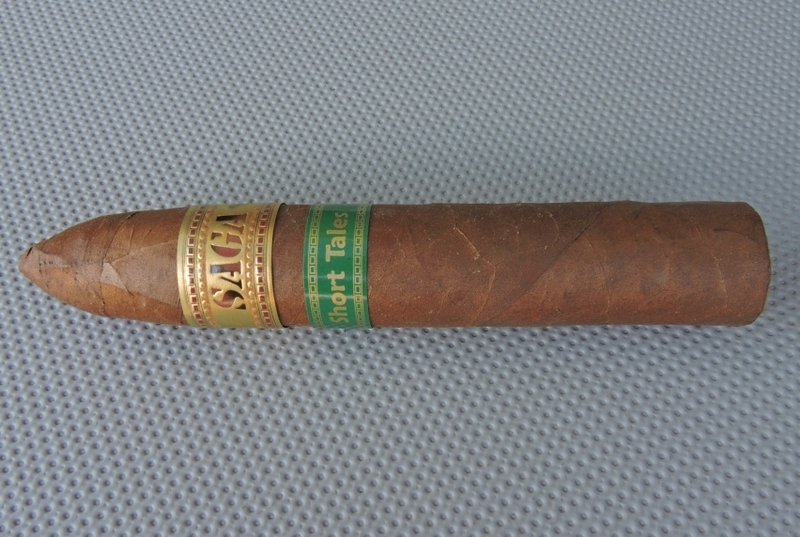 As for myself, it’s a cigar I would smoke again – and it’s worthy of a box purchase.